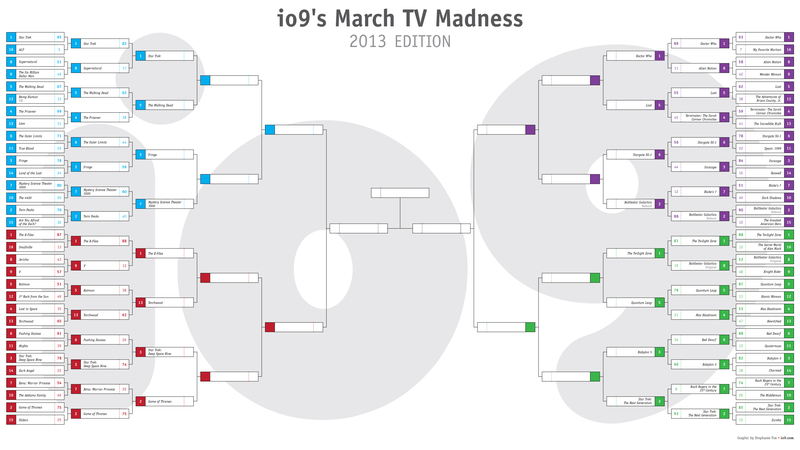 io9's March TV Madness: Doctor Who vs. Lost, Game of Thrones vs. DS9, and more! We've reached the Sweet Sixteen in our quest to find the greatest sci-fi and fantasy show of all time. 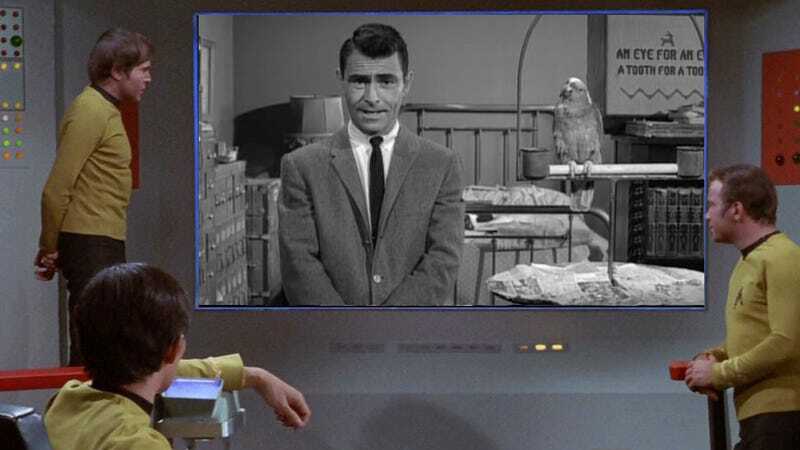 It's time for you to vote and to determine the winners of fierce match-ups including Fringe vs. MST3K, The Twilight Zone vs. Quantum Leap, and Star Trek vs. The Walking Dead! You can find all the polls down below — you can vote anytime between now and midnight Pacific time tonight. We're deciding the Sweet Sixteen today, and this Friday, March 22 we will vote on the Elite Eight in our March TV Madness. Next week will see our Final Four match-ups, the big championship game, and the unveiling of the Whedon Invitional Tournament — for more on just what that is, check out our first post, which also includes an explanation of how we put together the bracket. Speaking of which, the updated bracket is below. Click on it to expand, or go here for a bigger version. The Second Round saw some titans fall, as 2-seed Twin Peaks fell to Mystery Science Theater 3000. In the most brutal matchup, Farscape fell to kindred spirit Stargate SG-1 by a final margin of 56% to 44% — the selection committee is sad to see Crichton and company go, but then it wouldn't be March Madness without some heartbreak. Torchwood is the only double-digit seed left in the tournament, likely benefitting from its Doctor Who connection, the fact that it faced a pair of 60s shows in Lost in Space and Batman, and John Barrowman's dazzling smile. While we saw a number of routs, there were a few close contests, with all-time classic The Outer Limits putting up a valiant effort in its 56-44 losing effort against modern favorite Fringe. The tightest race was between Lost and Terminator: The Sarah Connor Chronicles, as the show with the controversial ending beat the show without an ending 55% to 45%. So what lies ahead in the Sweet Sixteen? In an intriguing showdown between sci-fi and fantasy heavyweights, Star Trek: Deep Space Nine faces off against Game of Thrones, which really puts us in the mood for a crossover starring Benjamin Sisko and Tyrion Lannister in a battle of wit and will, preferably assisted by Garak and Bronn. Elsewhere, can Torchwood continue its underdog run against one of its major influences, The X-Files? The Battlestar Galactica reboot and Stargate SG-1 are pitted against each other in a match that feels like a battle for the Syfy channel's very soul. And while we may not get to see Babylon 5 take on its major Star Trek rival, it does get the next best thing by going up against The Next Generation. And speaking of Trek, is the original Enterprise crew legendary enough to take down the modern-day juggernaut that is The Walking Dead? It's up to you to answer all these questions, so vote now! Polls will be open until midnight Pacific time tonight.